You heard of Grit, that combination of passion and perseverance that has been identified as a key to success. While much has been written on how to develop these attributes for adults, there hasn't been much practical advice on how to develop grit in children. Grit for Kids will teach you how to do this in 16 easy to follow chapters. 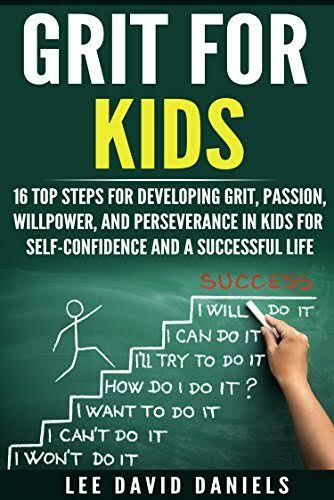 Each chapter contains real stories of kids facing common situations, proven steps to take in these situations, and the outcomes after the steps were taken. Your son or daughter will confidently be able to: Develop Discover what they're really interested in pursuing; belief in their skills; ability to overcome negativity; desire to learn more about everything; ability to bounce back after a setback; capability to defend their beliefs and opinions. Manage Ability to recognize and control emotional outbursts; recognize small vs. big problems and keep them in perspective; recognize their unique strengths and weaknesses; be appreciative of differences in people; learn to right the wrongs they may have caused to others. Plan Define goals related to their passion; break the goals into small achievable tasks; follow the process of completing tasks; set milestones for achieving a goal; celebrate when a milestone is reached; apply lessons learned from a setback; persevere in achieving goals. Grow Achieve conviction in their beliefs; learn to apply ethical and moral behavior; cultivate a desire for a deeper understanding of issues; acquire healthy habits for their body and mind.